It is not common for African primatologists and conservationists to mix, much less in a small town in Japan. But earlier this December, 16 African students representing 11 different countries came to Inuyama, Japan, to do just that. The odd group convened under the auspices of the African Primatological Consortium. The evolutionary source of all primates, Africa is endowed with the 64 primate species, 30 of which are threatened. There is, however, a dearth of African primate researchers and conservationists. The Consortium was formed in December 2014, with the aim of championing African primate research and conservation through research collaboration and capacity building. The African Primatological Consortium has roots in the Democratic Republic of the Congo’s (DRC’s) dense rainforests, where Dr. Takeshi Furuichi, of Kyoto University’s Primate Research Institute, spent decades studying the behavioral ecology and evolutionary anthropology of bonobos. Over that time, he witnessed the decline and loss of several bonobo populations in the Wamba, DRC, area due to poaching and habitat conversion. These even included some of his individual research subjects. He realized that the sustainability of such research was jeopardized by the increasingly precarious status of the bonobo and other primate species. That motivated him to pivot his thinking toward conservation in recent years. Jef Dupain, my colleague and a former bonobo researcher himself, shared Dr. Furuichi’s concerns. Both agreed that collaboration between the conservation and research communities could be mutually beneficial. They also recognized that few research or conservation programs developed African leaders. Strong African leaders within the research and conservation communities are necessary to speak forcefully for primate interests in the face of development and other threats, and to generate local and national appreciation for primate interests. Sponsored by the Japanese Society for the Promotion of Science and the African Wildlife Foundation (AWF), this month’s Primate Research and Conservation Training Seminar was the second major African Primatological Consortium event. But the two-week seminar is really just the start. The exposure to new tools and approaches, and the discussions this exposure inspires, serve as an incubator for collaborations that will extend far beyond Japan. In attendance were primate researchers like Grace Kagoro of Mbarara University of Science and Technology, who is studying chimpanzees in Uganda; and Urbain Ngobobo of Dian Fossey Gorilla Fund International, who is working to protect the Grauer’s gorillas, one of the world’s most endangered primates. AWF’s entire African Apes Initiative team also attended, including four individuals working in protected areas in Cameroon and DRC. Researchers from the Primate Research Institute led morning classes on DNA sample collection and analyses and field observations. 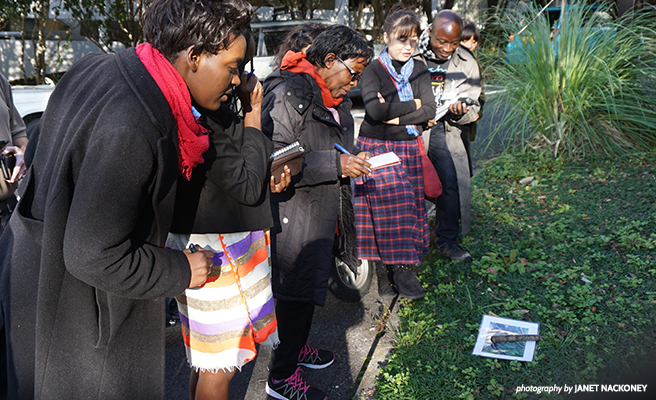 Conservationists from AWF, University of Maryland and Wildlife Protection Solutions took over in the afternoons with classes on geographic information systems (GIS) and emerging field data-collection tools. 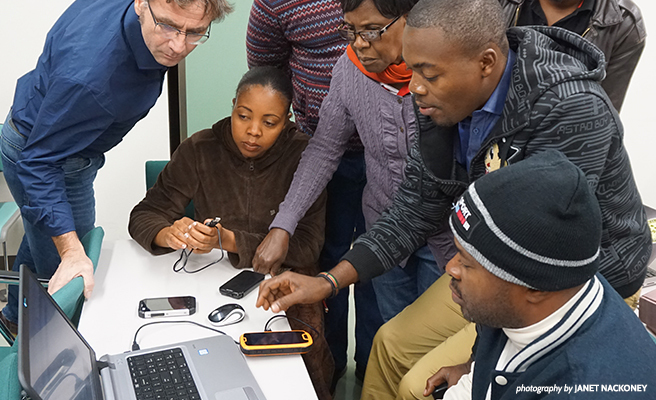 Participants in the Primate Research and Conservation Training Seminar took part in data-collection simulations, where they practiced entering observations they might make in the field into the CyberTracker app on a GPS-enabled smartphone. While their research goals varied widely, most of the primatologists and conservationists were interested in improving their ability to monitor the distribution, numbers, density or movement of their subject primates. The conservation portion of the seminar addressed these interests, emphasizing a set of spatial tools. As AWF’s director of conservation geography, I led field data-collection simulations in CyberTracker, a data-collection app that allows touchscreen entry of field observations on a GPS-enabled smartphone. With CyberTracker, a researcher in the field can immediately record things like wildlife encounters or areas of habitat degradation using data parameters created specifically for their area of research. The app automatically ties the GPS location to the newly recorded data. I also provided training on the Spatial Monitoring and Reporting Tool (SMART), a GIS software designed to import CyberTracker observations for mapping, management and automated reporting. CyberTracker and SMART are widely used in conservation to make data collection and reporting easier and more systematic, allowing more agile and targeted adaptive management. While Dr. Furuichi and AWF’s Jef Dupain have been the main drivers of the African Primatological Consortium, they are now relying on Moses Chemurot, a Ugandan researcher from Makerere University and consortium chairman, to sustain the collaborative momentum from Japan. Though the consortium boasts more than 120 members, it measures its success not by participation and conferences but by active collaborations that involve capacity development and impact on primate populations. Already, Grace Kagoro will use CyberTracker to map and investigate how Musanga tree regeneration relates to chimpanzee movement patterns and population status (the Musanga tree is a significant chimpanzee food source). Urbain Ngobobo will use a spatial analysis platform developed by AWF’s African Apes Initiative in DRC’s Kahuzi-Biega National Park to improve detection and responses to threats to Grauer’s gorillas such as poaching and snares. He will also use DNA analysis to gauge the size and structure of the population. Viviane Suniengo, one of DRC’s first female primatologists, will use CyberTracker to help understand the chimpanzee distribution and threats in DRC’s Luki Biosphere Reserve. Meanwhile, Wildlife Protection Solutions and AWF’s Apes Initiative team are coordinating with the Primate Research Institute to install AWF’s CyberTracker and SMART platform in Kalinzu Forest, Uganda. Embedded in this tool will be a real-time alert system developed by Wildlife Protection Solutions for urgent response incidents: When a ranger records a poaching incident with CyberTracker, it will automatically trigger a response from law enforcement. Rapid responses and repeated poacher arrests have sent a chilling message to poachers elsewhere—Kalinzu represents a major new collaboration for the African Apes Initiative team and the Primate Research Institute to do the same in Uganda. See how AWF is leveraging GIS tools in Central Africa.